i came across this post by writer anne lamott this weekend, and couldn’t help but feel the need to share. i’ve been doing a lot of thinking lately about how we aim for perfection, and feel we’ve failed when we achieve anything less. in the age of “pinterest perfect” – a phrase coined recently by one of my favorite bloggers, erin gates of elements of style – it’s really easy to feel like you’re not measuring up. like your home isn’t pretty enough, your thigh gap isn’t big enough, your outfits aren’t cool enough, your meals aren’t instagram-worthy. one of the things i love about reading blogs are that they are an escape. a pretty, cotton-candy colored, rose-tinted portrayal of life. one that’s lived in designer dresses and fancy shoes, one that involves perfect beachy waves and monthly getaways to mexico and kitchens that sparkle with marble and brass. and one of the things i hate about reading blogs is the fact that all of the above, all that i love about blogs…it’s not attainable. it’s not even really real. blogs these days aren’t reality, they’re someone’s carefully curated feed of shiny happy things, shiny happy moments. and let’s be honest for a second: life is not full of shiny happy moments. i mean, sometimes it is. sometimes it’s glorious and wonderful and magical. but sometimes, it’s not. and most bloggers don’t chose to share those moments. they’re purveyors of pretty, not purveyors of angry rants about the ways in which life gets them down. and i respect them for that, really, i do. they’ve made a conscious choice to show the good, not the bad. but my favorite bloggers are the ones that let a little bit of darkness in now and then (like erin gates, mentioned above, who inspired this post). erin recently participated in an episode of the lively show, and talked a lot about her perfectionism, and how it’s both worked against her and made her who she is today. the entire episode is worth a listen, but i found her examination of the “pinterest perfect” world we live in to be, by far, the most interesting portion of the show. because it’s true, isn’t it? we’re all on that seemingly endless quest for pinterest perfect, and none of us, and i mean none of us, will ever really achieve it. because it’s not real. life isn’t pinterest perfect. it’s messy and chaotic and full of all of the feelings. but that’s what makes it great. 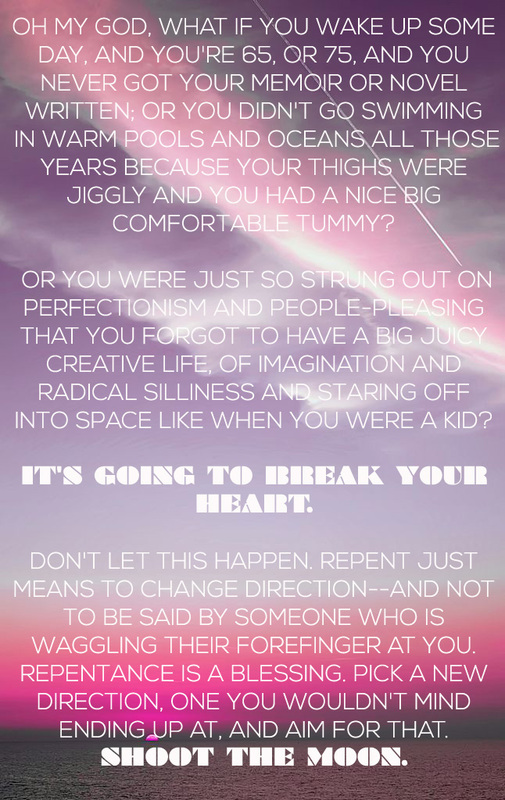 and if we keep holding out for pinterest perfect, and holding ourselves back from the doing the things we want to do – like lamott says above, if we keep holding ourselves back from going to the beach because we’ve got a big tummy and jiggly thighs – we’re limiting our lives, greatly. i don’t want to wake up when i’m 65 and realize i didn’t get to dig my toes into hot sand and feel the cool breeze of the ocean because i was embarrassed of how i looked in a bathing suit. i mean, i am embarrassed of how i feel in a bathing suit, but does that mean i should stop living? absolutely not. lamott is right. i don’t want to be so strung out on perfectionism that i forget to have a big, juicy, exciting, interesting, creative life. that would be the saddest of fates, wouldn’t it? to get to a ripe old age and realize i hadn’t done so many of the things i’d wanted to do because i thought i wasn’t good enough to do them. i refuse. i refuse. do you hear that, inner monologue? i. refuse. now, if you’ll excuse me, me and my jiggly thighs have a beach trip to plan.